Luke Kennard is a poet and writer of fiction who was born in Kingston Upon Thames in 1981 and grew up in Luton. He won an Eric Gregory Award from the Society of Authors in 2005 and his first collection of prose poems The Solex Brothers was published later that year by Stride. His second collection The Harbour Beyond the Movie was published by Salt in 2007 and was shortlisted for the Forward Prize for Best Collection, making him the youngest writer ever to be shortlisted. He has a PhD in English from the University of Exeter and lectures at the University of Birmingham. In 2014 he was named one of the Next Generation Poets by the Poetry Book Society in their once per-decade list. His fifth collection of poems, Cain, was published by Penned in the Margins in 2016 and selected as a book of the year by The Guardian and The Sunday Times and shortlisted for the 2017 International Dylan Thomas Prize. His first novel, The Transition, was published by 4th Estate in January 2017 and longlisted for the Desmond Elliott First Novel Award. Holly Pester is a poet, researcher, multidisciplinary writer and lecturer, Holly is fascinated by sound and performance. 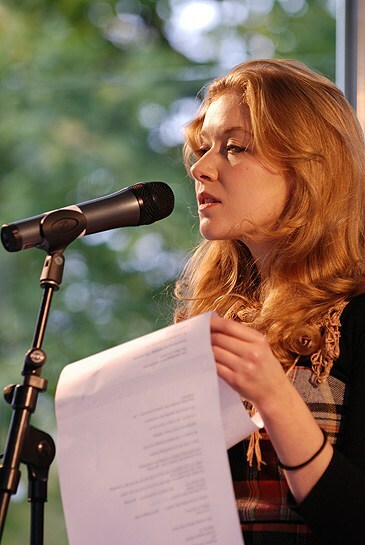 Holly has featured in readings, performances and sound installations in New York and London, and has been published in Poetry Review, Poetry London and the Believer. Her portfolio is a fascinating and eclectic mix of writing, music, sound poetry and theory. Her book, Go to reception and ask for Sara in red felt tip is a collection of ‘archive fanfiction’ (Book Works 2015) and her album Common Rest (Test Centre 2016) is a collection of collaborative lullabies and sound poems. The album is a multimedia collaborative work developed by Holly throughout her residency with Hubbub - an international team of scientists, historians, artists and broadcasters based at the Wellcome Collection - materialising Holly’s interest in speech rhythms and patterns which are responsive to work and rest. The album is accompanied by a book of poems by Holly.